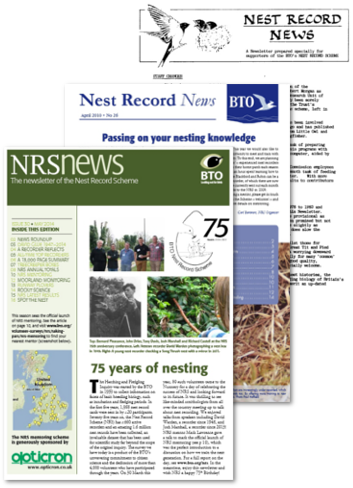 NRS News, also called Nest Record News, was started in 1984 by the late David Glue as the annual newsletter of the Nest Record Scheme. It ran for 31 editions and in 2015 was merged with the other Demography newsletters--Ringing News, CES News and RAS News--to form a single magazine, Life Cycle, for demographic monitoring volunteers. Life Cycle contains the same mix of news, survey results, volunteer-written articles and advice and tips as the newsletters it has replaced, and it is a natural fit for content about project-based, integrated ringing and nest recording activities, which are an increasing part of demographic monitoring.